Cortona, believe it or not, was a well-known Tuscan hill town before Frances Mayes wrote about renovating her house, “Casa Bramasole”, near here. It is now, more than ever and quite rightly, a not-to-be-missed stop on the Tuscan hill town circuit. 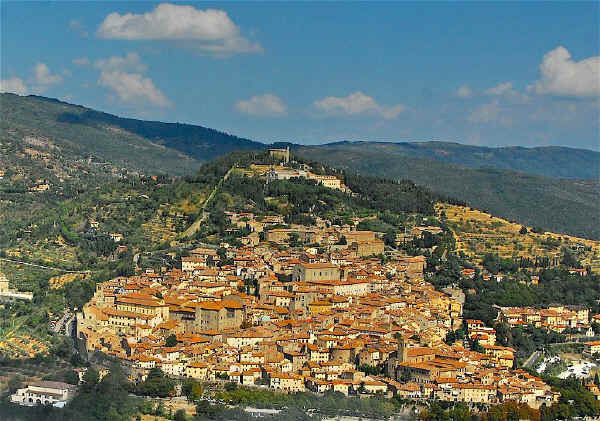 Despite Mayes' present continuous, creative writing course style, Cortona is an attractive place to spend a day or two with great art, great atmosphere, stupendous views to Lake Trasimeno and the Val di Chiana. An excellent range of vacation accommodations is available, ranging from rental villas, through agriturismi to fine hotels and Bed & Breakfasts. 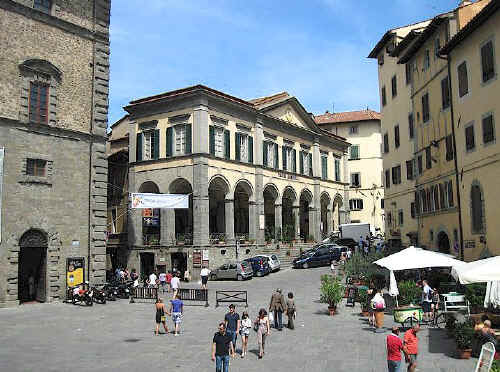 Cortona and Tuscany are the subject of several highly readable books by Frances Mayes wrote about renovating her house, "Casa Bramasole", in the area where she still lives for part of the year. These books give a highly authentic impression of life in this part of Italy. One of her books, Under the Tuscan Sun was made into a popular movie and inspired the name of the Tuscan Sun Festival held in Cortona every year usually during August and featuring classical music concerts, art exhibitions etc. 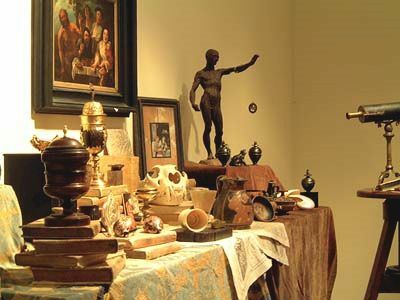 The "Cortonantiquaria" is one of the most important antique furniture fairs in Europe. The exhibition is housed in the 17 C Palazzo Vagnotti, located in the old town centre. More than 40 exhibitors are rigorously selected by a special commission. Furniture, jewellery, carpets and bronzes are some of the objects displayed together in the show. Cortona is a small but fascinating city in the province of Arezzo, Tuscany, central Italy, situated on a commanding hill, and overlooking Lake Trasimeno. Its cyclopean walls reveal its Etruscan origins. It was one of the twelve cities of Etruria and in its vicinity many Etruscan ruins and tombs may be seen. Cortona sided against Rome until 310 B.C. when Fabius Rullianus defeated the Etruscans and took Perugia. Perugia, with other cities, including Cortona, then made peace with Rome. Later Cortona was destroyed by the Lombards but was soon rebuilt. 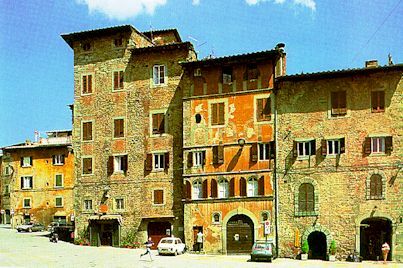 In the 14 C, it was governed by the Casali and afterwards became part of the Grand Duchy of Tuscany. Private tours for up to six guests. This costume festival re-enacts the wedding of Francesco Casali, lord of Cortona, to Antonia Salimbeni from Sienna, in 1397. To commemorate the couple, the crossbowmen of Cortona's five 'quintieri' or districts compete in a crossbow (ballestero) competition, aiming at a target called 'quintiere'. 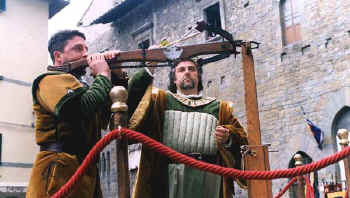 The winner is given the first prize, the Verretta d'Oro (golden crossbow dart). The event includes stalls selling mediaeval food, mediaeval dinners and entertainment typical of the mediaeval times. For dates, please refer to Festivals of Tuscany. Tuscan fractional-ownership apartments available for purchase. Borgo di Vagli is a private, member-owned, fractional ownership community composed of attractive one- and two-bedroom residences on the Tuscany-Umbria border. Borgo di Vagli has been beautifully restored to offer a unique and affordable opportunity for fractional ownership of a historical country home in Tuscany, providing worry-free ownership and ensuring totally relaxed vacations. Click here for more about Borgo di Vagli fractional ownership. Vorresti pubblicizzare la tua attività su questo sito web per Cortona e ricevere traffico in entrata dalla nostra rete di più di 50 portali relativi? Clicca qui per ulteriori dettagli in merito alla nostra soluzione integrata per una presenza su internet piena di successi. In addition to the famous formal gardens of Florence and Rome, many of the villas of the Tuscany countryside have beautiful and in some cases spectacular gardens that are open to the public. The Maremma is an diverse and in places quite wild area of southwestern Tuscany and northernmost Latium, encompassing the Tyrrhenian seashore (beaches), coastal plains (wild life reserves) and inland hill towns. Click here to learn about the Maremma coastline, thermal springs, nature reserves, Etruscan remains and some very economical vacation accommodations. Introduction to the ceramics and the history of Deruta in Umbria. 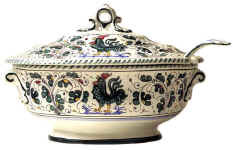 Interested in wines as well as ceramics? Gallo Nero, symbol of the Chianti Classico wine zone and of increasingly excellent wines. 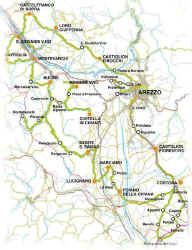 Map and wine towns. Cortona © ammonet InfoTech 1998 - 2018. All rights reserved.